Learn about the difference in window replacement costs. 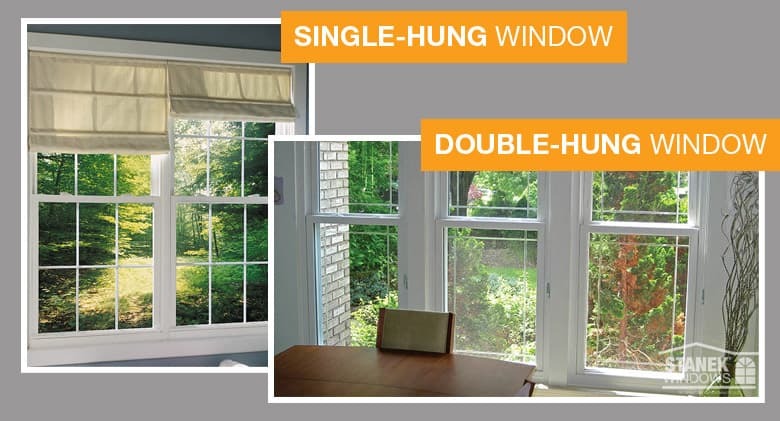 A side by side comparison of single-hung and double-hung windows. In many cases, window replacement is not an inexpensive renovation. Remodeling Magazine’s Cost Versus Value 2013 lists window replacement as ranging from $9,000 on the low side to over $16,000 on the high end, while Consumer Reports suggests the cost could top $20,000 or more. Therefore, it is imperative homeowners spend time researching options prior to deciding on the window – or windows – that will work best for their needs. Why Such a Big Difference In Window Replacement Costs? While homeowners automatically consider options one through three when it comes to window replacement, option number four might not get as much attention as it should. Yet major differences exist between each style of window. In this article we’ll specifically look at the differences between single- and double-hung windows and compare the pros and cons of each. You'll be surprised to know there are major differences between the two in terms of ventilation along with the ease and cost of maintenance and cleaning. Cleaning Difficult to clean the exterior of the top sash since it does not tilt in. Tougher to clean for those living on an upper floor. Easier to clean since both windows can be tilted to wash inside and outside surfaces. Both sashes can be cleaned from the inside of the house. Single-hung windows are often the standard window option used in newer home construction, apartment buildings and office spaces. In a single-hung window the bottom panel, or sash, moves vertically, while the upper sash remains stationary. When opened, the bottom sash obstructs, at least partially, the upper sash. 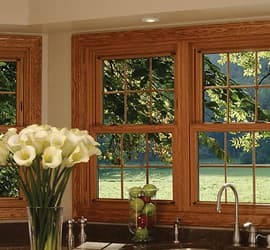 Single-hung windows are a popular choice for one main reason: cost. 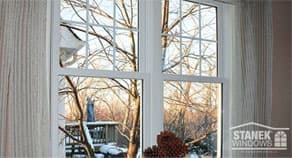 They are cheaper than double-hung windows; in fact, according to Sven Kramer of Stanek Windows by Great Day Improvements, LLC, single-hung windows can cost 10-20% less than their double-hung competitor. While this may not seem like a great difference when replacing one or two windows, homeowners in need of a dozen windows will find the cost difference quickly adds up. Those on a tight budget might turn to single-hung windows to save on initial costs. However, these windows have many limitations, and in the long run a double-hung window is a better option for nearly all homeowners. Because only the lower sash opens in a single-hung window, the window offers limited ventilation. In rooms that require more ventilation, such as the bathroom, this can result in higher moisture levels and little relief from humidity, mildew growth and odor control. 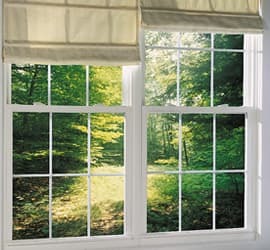 Additionally, single-hung windows make cleaning difficult, particularly for those with homes built off of the ground or on floors higher than ground level. Since the top sash is not operable, homeowners can only clean the outside of the upper sash by accessing it from the outside of the home. For many homeowners this requires hiring a window cleaning company multiple times per year for those difficult-to-reach windows. Though the cost of the single-hung window is lower up front, the costs over time associated with ventilation and cleaning can run much higher than those for double-hung windows. Double-hung windows differ from single-hung in that they offer the homeowner the ability to open each sash, rather than just the bottom sash. This allows for better air flow and ventilation. The ability to open and tilt each sash makes cleaning easier, too. Homeowners living off of the ground level are able to tilt the sashes inward and clean both the interior and exterior surfaces of the glass without needing special equipment or a professional cleaning company to do the chore for them. If you’re concerned about the cost difference, don’t forget that many utility companies offer rebates to homeowners who install energy efficient windows, which can greatly reduce the cost of your window replacement project. While double-hung may cost more up front, in the long run, the added features for security and maintenance could save you greatly. 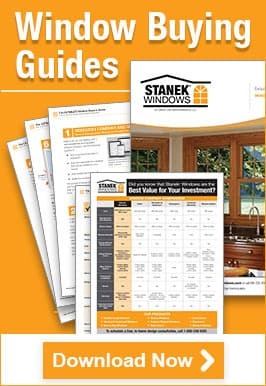 For more information about your window replacement needs, contact Stanek Windows by Great Day Improvements at 1-800-230-8301 or schedule your free, in home consultation online.